Every gardener has a toolkit for gardening tools, wherein rake is a must have. When people hear about rake they can just imagine using it for gathering the dead leaves. But did you know rakes cannot be just for gathering dead leaves but for tamping soil, spreading soil cover and many other uses. Rakes are effectively designed to pick up leaves and other garden debris without damaging the lawn and the soil beneath. Soil rakes are intended to level and grading the soil before the plants and seeds are been planted in the soil. 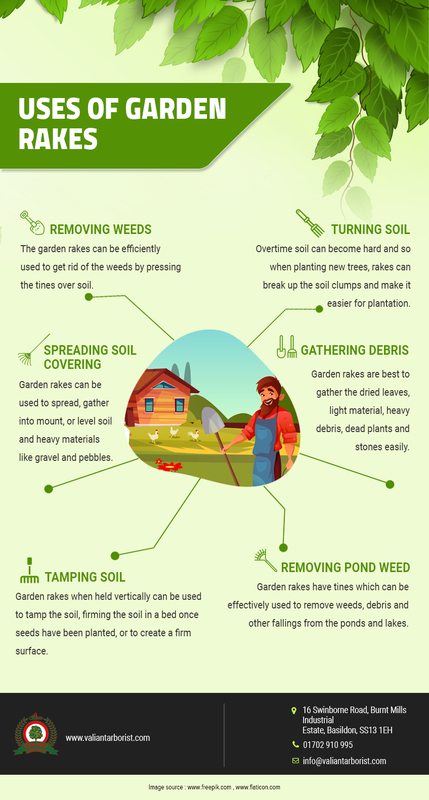 Overtime soil loses it moisture in summer seasons which can harden the soil and create clumps of soil which can be easily broken with the help of the rake. Gardens are beautiful but need ample maintenance. If you are looking for someone potential to take care of your garden Valiant Arborist, as tree surgeon Essex, is here to help you. At valiant Arborist, we specialize in hedge cutting trimming and reduction, lawn moving, weed control and examination. Along with this, we provide regular garden maintenance, vegetation removal, pest controls, garden tidy-ups. We as gardeners in Essex, are one-stop destination for all your garden needs. For more get in touch with us today. Call or talk to our experts.